Hebrew is not the first language that I recommend learning. It is an odd language to English speakers because it uses a Semitic alphabet and reads right to left. Furthermore, unlike Greek and Latin, there are few words in English that derive from Hebrew. Greek and Latin are therefore better to teach to young children. The answer is simple. Hebrew is the primary language of the Old Testament, which makes up 3/4 of the Bible. You read that right—75% of the Word of God is in Hebrew. So if you want to study the Bible, Hebrew is worth your time and effort. Ideally, a person should begin learning Latin around middle school followed by Greek in high school. Hebrew would then be studied in college or seminary. Of course, we don't live in an ideal world. Most people have never studied Greek or Latin. But that's okay—you can still learn biblical Hebrew! Whether you want to learn for yourself or you want to teach your children, there are great resources out there for studying this important language. The video lectures available make this a good subject for study, including for homeschoolers. Basics of Biblical Hebrew Grammar by Gary Pratico and Miles Van Pelt. This Hebrew textbook is widely used in seminaries because it presents the material in a clear and simple manner. Make sure to also buy the companion Basics of Biblical Hebrew Workbook. Basics of Biblical Hebrew Video Lectures (DVDs). While you can learn Hebrew from a book, it helps to listen to instructional lectures—especially for learning pronunciation. Miles Van Pelt is a great teacher, and I highly recommend this video lectures. The lectures essentially provide a full two courses in elementary Hebrew. This video provides a sample lesson. You can also stream the lectures through Amazon. The Learn Biblical Hebrew Pack. The textbook, workbook, and video lectures above are the necessities for learning biblical Hebrew. If you want all these things, plus the Hebrew vocabulary cards, then the best deal is the Learn Biblical Hebrew Pack. 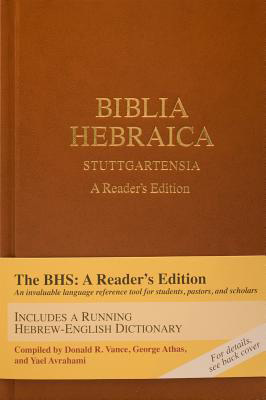 There are other resources available, including a laminated summary sheet, a Charts of Biblical Hebrew, and a shorter version of the grammar (Biblical Hebrew: A Compact Guide). Biblia Hebraica Stuttgartensia (BHS). This is a Hebrew Bible with text critical notes. This is a beautiful edition, and it is useful for scholarship. BHS: A Reader's Edition. This is great for just reading Hebrew. There will be a lot of words you don't know, and a reader's Bible will gloss rarer words in the footnotes. You will likely find this more useful than the non-reader's edition. I also prefer this edition over the similar A Reader's Hebrew Bible. Graded Reader of Biblical Hebrew: A Guide to Reading the Hebrew Bible by Miles Van Pelt and Gary Pratico. This is an intermediate Hebrew workbook. It is designed for use in a Hebrew exegetical course and should follow the completion of the Basics of Biblical Hebrew grammar and workbook. 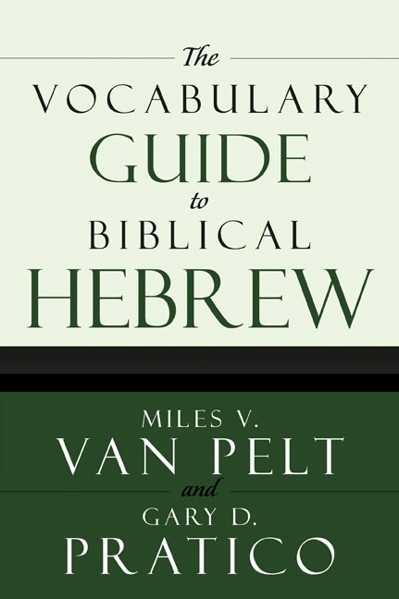 The Vocabulary Guide to Biblical Hebrew by Miles Van Pelt and Gary Pratico. A useful resource for Hebrew vocabulary. 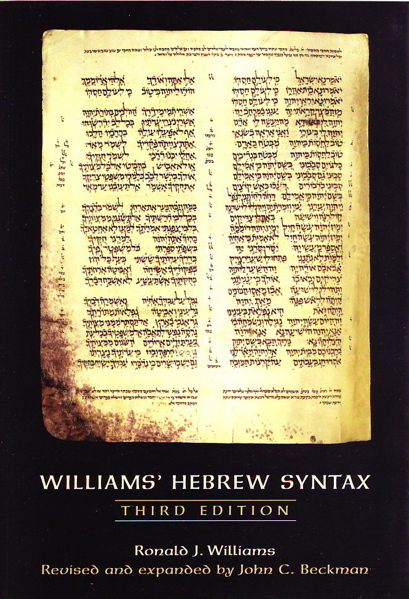 Williams' Hebrew Syntax. This is an introductory work to Hebrew syntax. 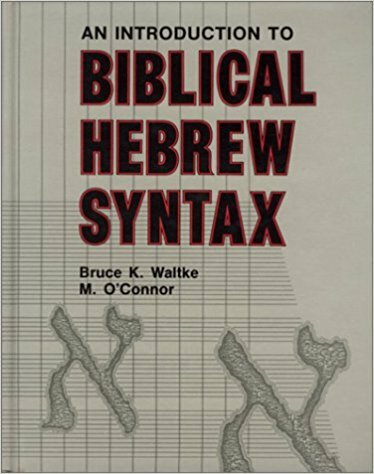 An Introduction to Biblical Hebrew Syntax by Bruce Waltke and M. O'Connor. This is a larger work on Hebrew syntax. A Concise Hebrew and Aramaic Lexicon of the Old Testament by William Holladay. This is a concise Hebrew lexicon (dictionary). The Hebrew and Aramaic Lexicon of the Old Testament (HALOT) by Koehler and Baumgartner. This is expensive, but it is the best Hebrew lexicon out there. It is two volumes. New International Dictionary of Old Testament Theology and Exegesis (NIDOTTE). This is an indispensable resource for Hebrew word studies. It is likely more useful than a mere lexicon, as there are entire short articles on many words. This is expensive because it is five volumes. But it's worth it. There are a lot of Hebrew resources out there. But do not be overwhelmed. If you want to learn Hebrew or if you want to teach it to your children, start with The Learn Biblical Hebrew Pack, which includes the book, workbook, and video lectures. This is all you need to start learning Hebrew!